Dahlias Desire - Flower Art Tote Bag by Artist & Painter Adesina. Keep it Springtime all year round, and carry your belongings in style, with Adesina’s brightly colored “Dahlia’s Desire” Tote! This beautiful 13″ x 13″ tote bag sports a gorgeous print of Adesina’s “Dahlia’s Desire” painting, and is made from soft, durable, poly-poplin fabric. It also includes a 1″ black strap for easy carrying on your shoulder. All seams are double-stitched for added durability. Each tote bag is machine-washable in cold water and is printed on both sides with the same image. 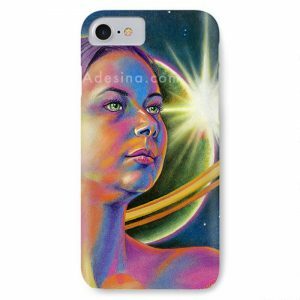 Phone cases and bags ship for a flat rate within the US, & ship separately from other merchandise. Please allow 7-8 business days for printing and transit time. If you would like to purchase outside of the US, or need expedited shipping, please contact us and we’ll send you a direct link to the manufacturer. Thanks!